Samsung Galaxy Note Edge price is revealed. 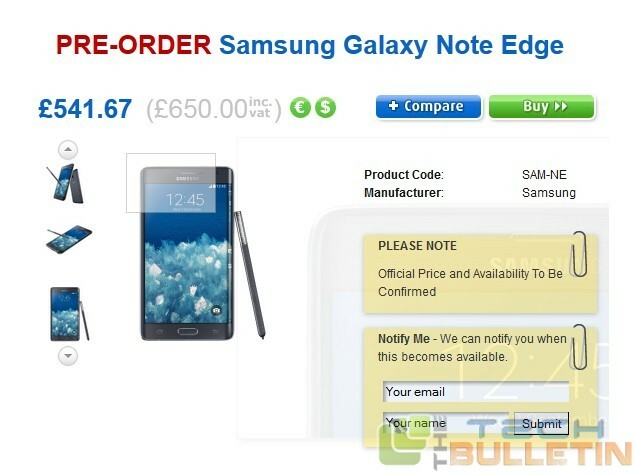 The Samsung’s recently launched Galaxy Note Edge has already gone on the pre-order at GBP 650 in UK via a third-party online retailer, taxes are included. Whereas without VAT price listed by online retailer Clove for the 32 GB variant of the Samsung Galaxy Note Edge will near around GBP 541.67. The Edge uses Samsung’s flexible-display technology, that came out as a phone and a fitness device with displays that were slightly curved. The Samsung Galaxy Note Edge has a 5.6-inch Quad-HD+ (1440+160×2560 pixel) with Super AMOLED extended curved display, and is powered by a Qualcomm quad-core 2.7 GHz processor which is coupled with a 3 GB of RAM. It will available will be available in 4G LTE and 4G LTE Cat. 6 (LTE Advanced) variants. The handset packed with a 16 mega-pixel auto focus rear camera along with Smart OIS and LED flash light. It also has a 3.7-megapixel front-facing camera which has a f/1.9 lens. The Samsung Galaxy Edge will offered many connectivity option like as Wi-Fi 802.11 a/ b/ g/ n/ ac, GPS/ Glonass, NFC, Bluetooth v 4., IR LED, USB 2.0, and MHL 3.0. The Galaxy Note Edge is packed with a 3000mAh battery and it is only 174 grans in weight. According to the Korean Company Samsung, the Galaxy Note Edge curve display end is very useful for the notification and other features of the Smartphone which helped the user without getting inside in the notification panel of the Smartphone.